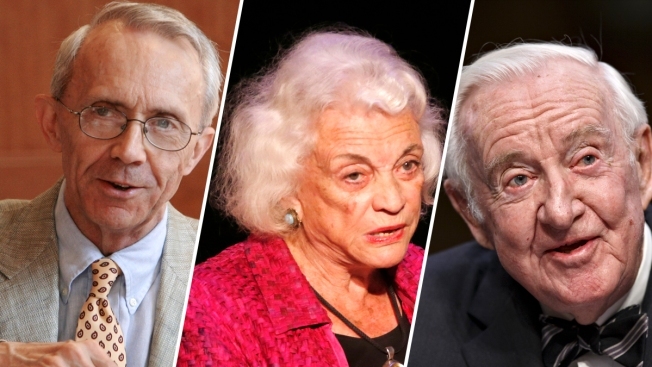 Retired Supreme Court Justices David Souter (L), Sandra Day O'Connor (C) and John Paul Stevens (R) each took different paths following their retirement from the court. 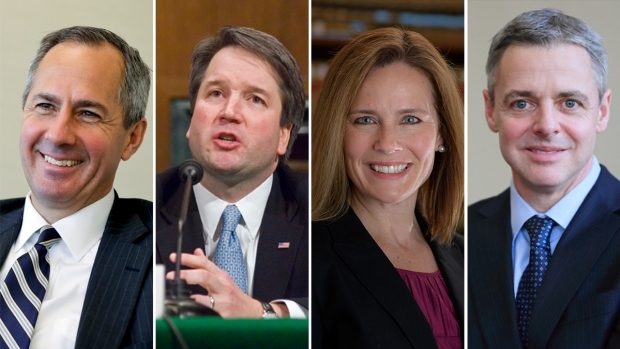 For more than 30 years Justice Anthony Kennedy has lived by the Supreme Court's predictable calendar: hearing new cases beginning on the first Monday in October, arguments starting at 10 a.m. and near-weekly conferences with colleagues until the court adjourns in June. Soon, he'll have no fixed schedule. Kennedy, 81, hasn't said what he'll do with all his upcoming free time. The three most recent retirees from the court — John Paul Stevens, David Souter and Sandra Day O'Connor — each charted somewhat different paths. In announcing last week that he is stepping down, Kennedy said he wanted to spend more time with his family. Former clerks say Kennedy, a father of three and "Papa" to nine grandchildren, is an enthusiastic grandparent, one who has attended grandkids' T-ball games and ballet performances. He spoke at the high school graduations of two of his grandchildren this year and has talked about seeing "Hamilton" with his grandchildren on Broadway. This summer, Kennedy is teaching at the University of the Pacific's McGeorge School of Law's program in Austria, a practice of his for decades. He's taught in some capacity for the California school since 1965, and the school's dean has already offered him any teaching gig he wants after he leaves the court, though Kennedy hasn't made any commitments. Former clerks also noted Kennedy's longtime interest in China and said they could see him continuing to be an ambassador for the law and for civility in the legal profession. Stevens, 98, hasn't stopped writing since he left the court in 2010 and became a permanent resident of a state with its share of retirees: Florida. A year after leaving the court, Stevens published a memoir, "Five Chiefs," about the five chief justices he served under. A second book, "Six Amendments: How and Why We Should Change the Constitution," followed in 2014. One of the amendments the liberal justice proposed revising was the Second Amendment. Stevens returned to the topic again this year. After marches following the school shooting in Parkland, Florida, in which 17 people died, Stevens wrote an essay for The New York Times calling not only for significant gun control legislation but also the Second Amendment's repeal. What issues, if any, Kennedy might speak out on are an open question, though he's spoken harshly in the past about solitary confinement. Souter, 78, never really liked Washington and quickly returned to his home state of New Hampshire after leaving the court in 2009. He was just shy of 70 when he retired, more than a decade younger than Kennedy. Before joining the Supreme Court, Souter had been a judge on the federal appeals court based in Boston, and he's served on the court regularly in retirement, hearing more than 400 cases. Kennedy could also sit as a visiting judge on other courts. He was a judge on the San Francisco-based U.S. Court of Appeals for the 9th Circuit before joining the Supreme Court. Not all retired justices are interested in wearing judicial robes again. Stevens, who served on the federal appeals court based in Chicago before joining the Supreme Court, told an interviewer in 2011 that serving as a judge again in retirement wasn't for him. "I kind of like not having to read a lot of briefs and get reversed by my former colleagues," Stevens said. After Kennedy's retirement announcement, Stevens issued a statement that said in part that Kennedy had "earned the right to enjoy a more leisurely life without the constant burden of reading briefs." O'Connor, 88, left the court in 2006 under unhappy circumstances. Her husband was suffering from Alzheimer's disease and O'Connor, then 75, retired in part to care for him. He died in 2009. Like Souter, the Arizona native returned to her home state and served as a visiting appeals court judge, hearing more than 175 cases and serving with all but two of the nation's 13 federal appeals courts. She also founded iCivics, an organization that promotes civic education in schools. In 2009, O'Connor expressed regret that some of her decisions were being "dismantled" following her departure, with Kennedy generally taking her place as the court's crucial vote in cases where the justices split 5-4. In 2010, shortly after Kennedy authored the court's 5-4 decision in the Citizens United campaign finance case, O'Connor told an audience: "Gosh, I step away for a couple of years, and there's no telling what's going to happen."